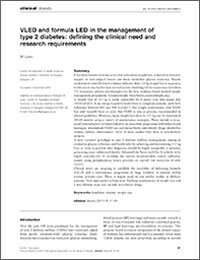 Lean, M. VLED and formula LED in the management of type 2 diabetes: defining the clinical need and research requirements. Clinical Obesity 2011; 1(1): 41-49. DOI: 10.1111/j.1758-8111.2010.00007.x. VLED and formula LED in the management oftype 2 diabetes: defining the clinical need andresearch requirements.